In principle, soil acidification is a natural process. However, nitrogen pollution originating from anthropogenic agriculture, traffic and industry accelerates this process considerably. Soil bacteria convert ammonium into nitrate and acidity (nitrification). Excess nitrogen then is leached as nitrate. Thereby the negatively charged nitrate carries positively charged ions out of the system. In less acid soils base cations like calcium, potassium, magnesium and sodium are involved; in more acid soils aluminium, manganese and protons. Consequently, soil concentrations of calcium, potassium and magnesium are strongly depleted in many forests. The proportion of base cations on the ion exchangers of the soil is called base saturation. Base saturation below 40% is regarded to be low, <15% critically low and < 5% extremely low. For a sustainable management and forest stability a base saturation of at least 50% is considered to be sufficient for deciduous forest, for coniferous forests at least 40%. In 8% of our permanent observation plots, base saturation is critical (<15%), in another 26% it is low (<40%). 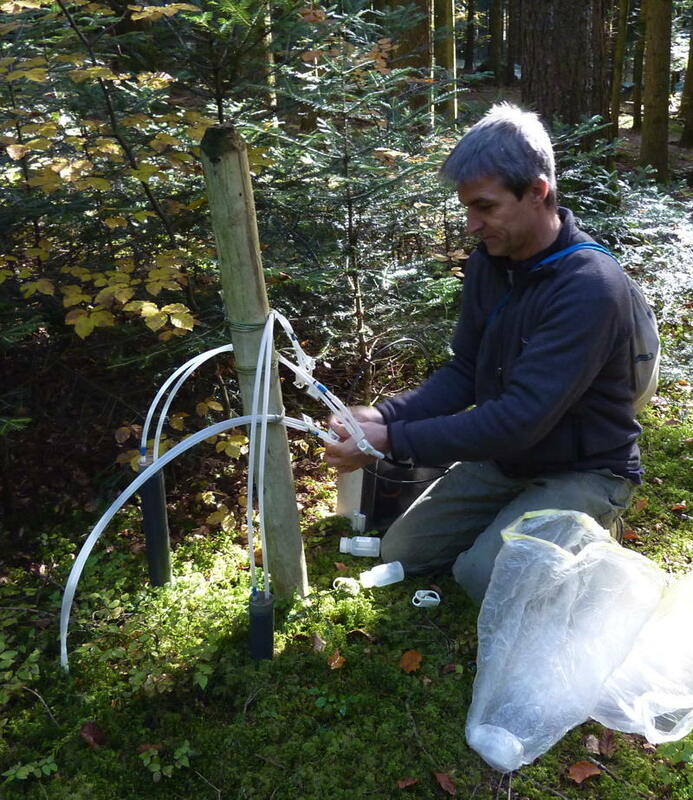 Root depth and the number of needle years in spruce were significantly reduced in plots with a base saturation lower than 20%. Risk of uprooting was increased on soils with a base saturation lower than 40% (see also section ‘Extreme weather’). Left: Collection of soil water samples for chemical analysis. We monitor the process of soil acidification with suction cups (lysimeters) in 48 observation plots. The ratio of base cations to aluminium (BC/Al ratio) is an important indicator for soil acidification. With increasing soil acidification the availability of phytotoxic aluminium ions (Al) in soil solution increases. The UNECE has originally defined a threshold of 1 for the BC/Al ratio. The value in forest ecosystems should not be lower than this threshold. However, base saturation at this threshold is already very low. Based on a nitrogen fertilization experiment on Zugerberg, we were able to demonstrate that the input of neutral ammonium nitrates leads to increased soil acidification: the BC/Al ratio is reduced more strongly where nitrogen inputs are higher. Left: Relationship between BC/Al ratio and base saturation in the layers equipped with suction cups. fertilizer was applied. The atmospheric deposition at this site is 20 kg nitrogen per hectare and year.